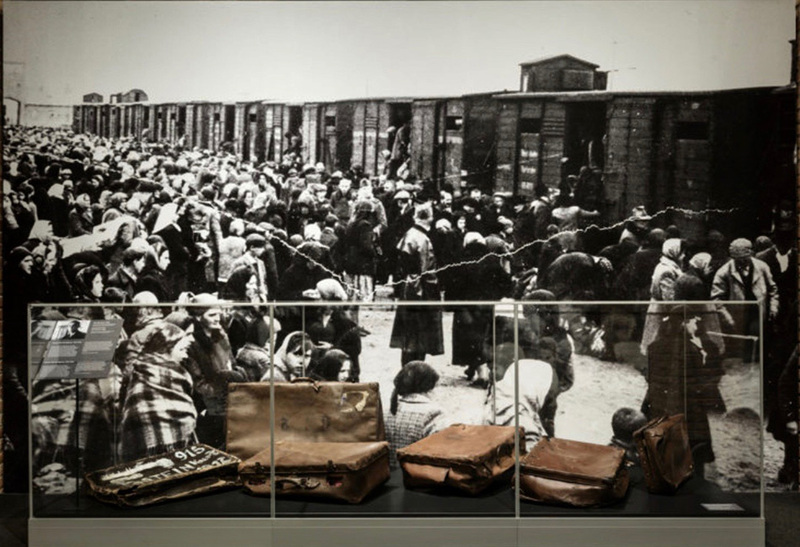 The Museum of Jewish Heritage will open its doors to the largest and most extensive exhibition on Auschwitz ever presented in the United States, featuring more than 700 original objects and 400 photographs ~ Auschwitz. Not long ago. Not far away. 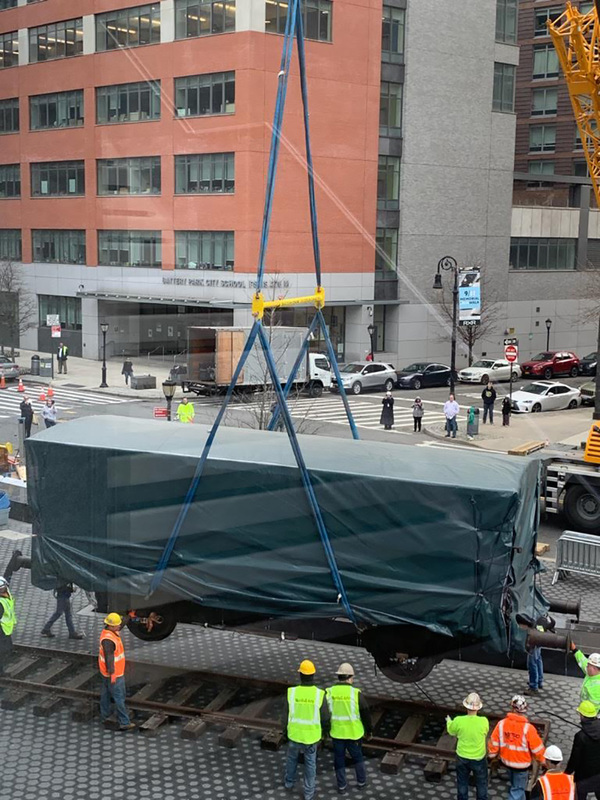 In advance of the exhibition, a freight car used by the Deutsche Reichsbahn (German National Railway), one of 120,000 built between 1910 and 1927, arrived downtown, greeted by the Museum, Survivors, and a great deal of press. 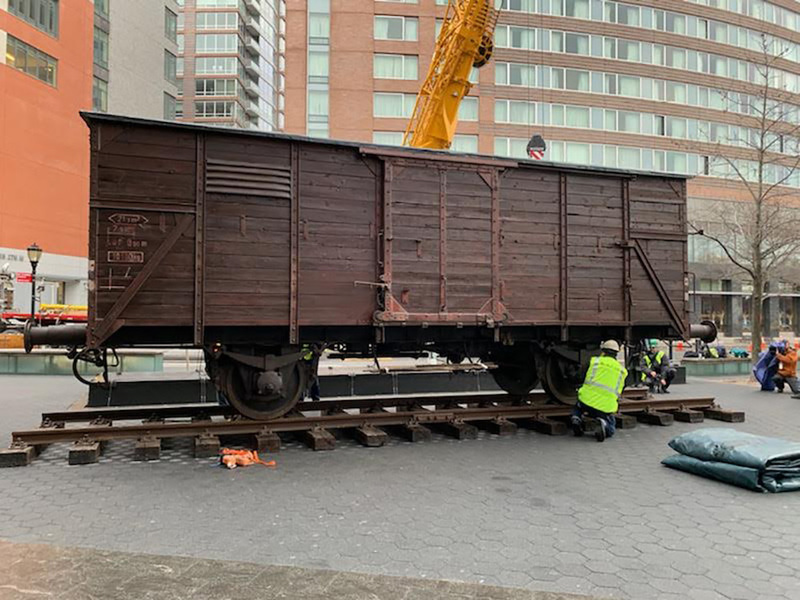 The freight car will be on view in front of The Museum of Jewish Heritage throughout the exhibition. 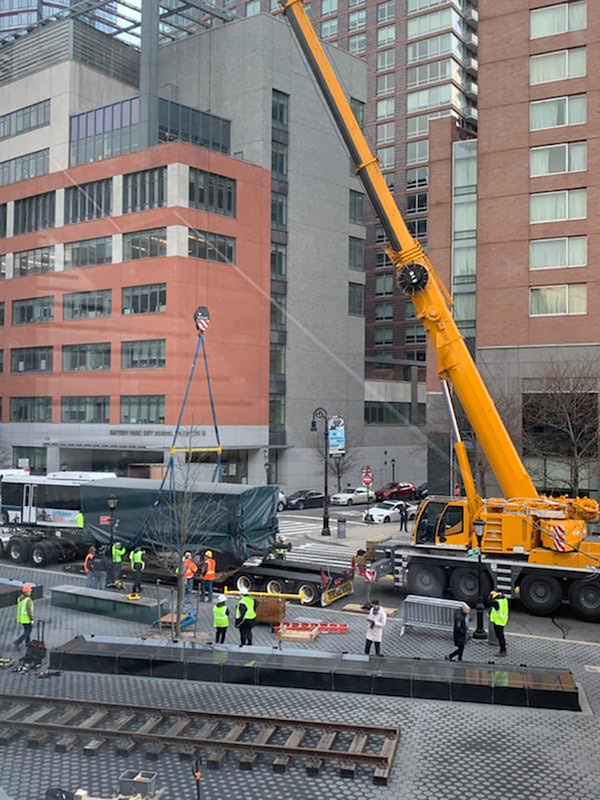 Below are images of its arrival and placement on the track in front of the Museum courtesy of Anat Gerstein, Inc. 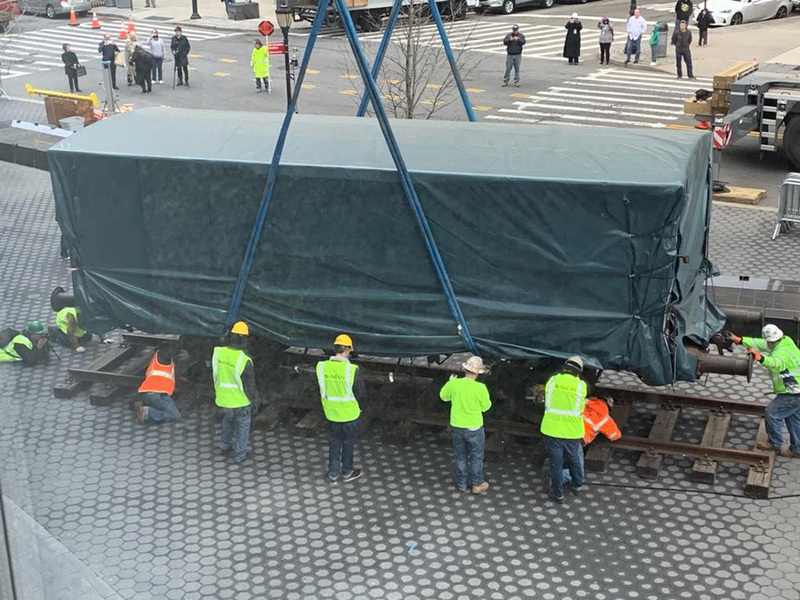 Arrival of freight car on March 31st. 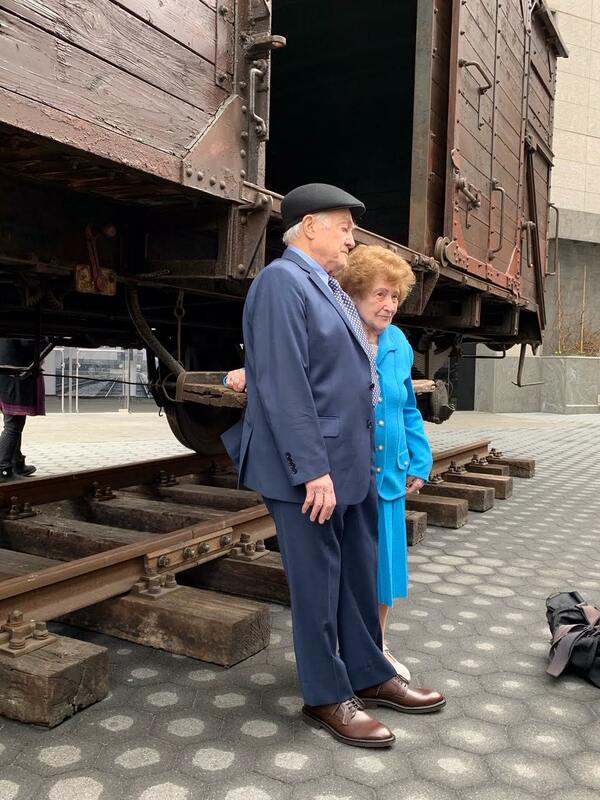 Image courtesy of Jeff Simmons, Executive Vice President, Anat Gerstein, Inc.
For the first time, 74 years after the liberation of Auschwitz, a traveling exhibition dedicated to the historical significance of the camp will be presented to a U.S. audience. The exhibition’s opening on May 8 marks the anniversary of VE Day or Victory in Europe Day, 1945, when the Allies celebrated Nazi Germany’s surrender of its armed forces and the end of World War II. Image courtesy of Jeff Simmons, Executive Vice President, Anat Gerstein, Inc.
Auschwitz. Not long ago. Not far away. traces the development of Nazi ideology and tells the transformation of Auschwitz from an ordinary Polish town known as Oświęcim to the most significant Nazi site of the Holocaust—at which approximately 1 million Jews, and tens of thousands of others, were murdered. Victims included Polish political prisoners, Sinti and Roma, Soviet POWs, Jehovah’s Witnesses, and those the Nazis deemed “homosexual,” “disabled,” “criminal,” “inferior,” or adversarial in countless other ways. In addition, the exhibition contains artifacts that depict the world of the perpetrators—SS men who created and operated the largest of the German Nazi concentration and extermination camps. Arrival of freight car. Image courtesy of Jeff Simmons, Executive Vice President, Anat Gerstein, Inc. 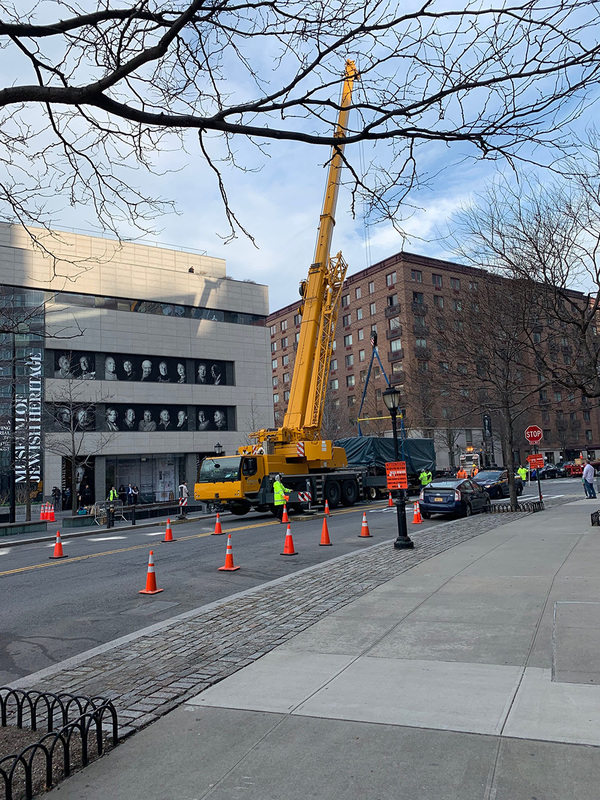 The Museum of Jewish Heritage has incorporated into the exhibition more than 100 rare artifacts from its collection that relay the experience of survivors and liberators who found refuge in the greater New York area. 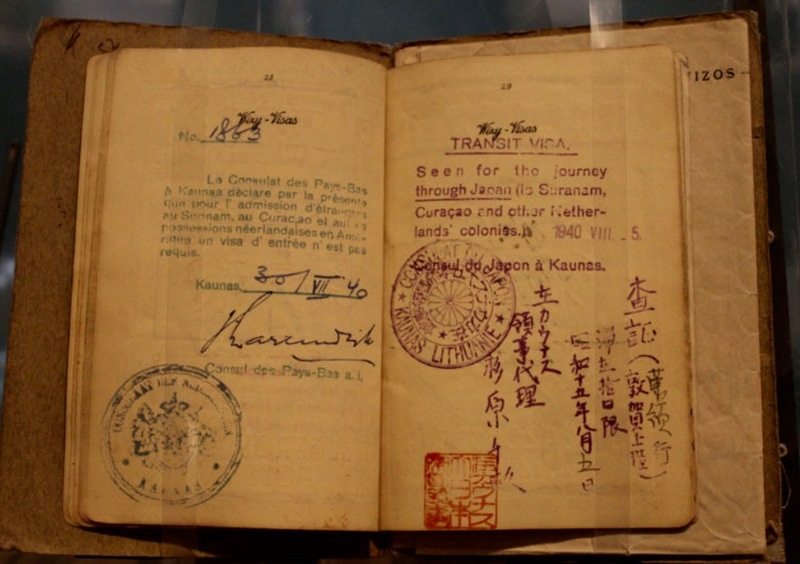 These artifacts include: Alfred Kantor’s sketchbook and portfolio that contain over 150 original paintings and drawings from Theresienstadt, Auschwitz, and Schwarzheide; the trumpet that musician Louis Bannet (acclaimed as “the Dutch Louis Armstrong”) credits for saving his life while he was imprisoned in Auschwitz; visas issued by Chiune Sugihara, a Japanese diplomat in Lithuania often referred to as “Japan’s Oskar Schindler”; prisoner registration forms and identification cards; personal correspondence; tickets for passage on the St. Louis; a rescued Torah scroll from the Bornplatz Synagogue in Hamburg; and dreidels and bullets recovered by Father Patrick Desbois in a Jewish mass grave in Ukraine. Lowering freight car onto the track. Image courtesy of Jeff Simmons, Executive Vice President, Anat Gerstein, Inc.
Also on display from the Auschwitz-Birkenau State Museum, the Museum of Jewish Heritage collection, and more than 20 other lending institutions, will be hundreds of personal items (e.g., suitcases, eyeglasses, and shoes) that belonged to people murdered in Auschwitz and to people who survived. Concrete posts that were part of the fence of the Auschwitz camp; an original barrack; a gas mask used by the SS; drawings by Alfred Kantor and David Olère. Heinrich Himmler’s SS dagger and helmet and his annotated copy of Hitler’s Mein Kampf, as well as an anti-Jewish proclamation issued in 1551 by Ferdinand I that was given to Hermann Göring by German security chief Reinhard Heydrich on the occasion of Göring’s birthday. The proclamation required Jews to identify themselves with a “yellow ring” on their clothes. Heydrich noted that, 400 years later, the Nazis were completing Ferdinand’s work. These artifacts stand as evidence of a chapter of history that must never be forgotten. The exhibition features artifacts and materials—never before seen in North America—on loan from more than 20 institutions and private collections around the world. In addition to the Auschwitz-Birkenau State Museum and the Museum of Jewish Heritage – A Living Memorial to the Holocaust, participating institutions include Yad Vashem in Jerusalem, Anne Frank House in Amsterdam, United States Holocaust Memorial Museum in Washington, Auschwitz Jewish Center in Oświęcim, the Memorial and Museum Sachsenhausen in Oranienburg, and the Wiener Library for the Study of the Holocaust and Genocide in London. Survivor Ray Kaner and her husband Leon. Image courtesy of Jeff Simmons, Executive Vice President, Anat Gerstein, Inc. 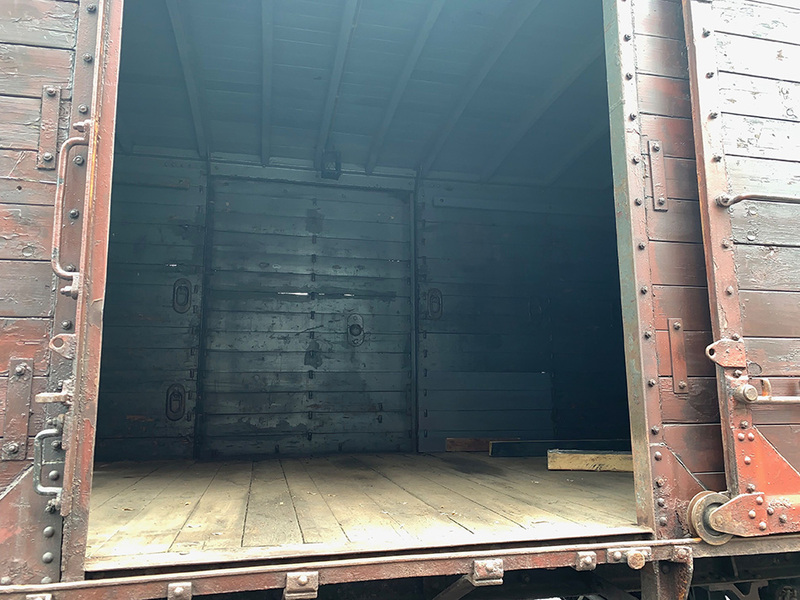 Above, Ray Kaner, holocaust survivor ~ below, Dr. Ruth Westheimer on Sunday, March 31, 2019, for the arrival of the freight car. 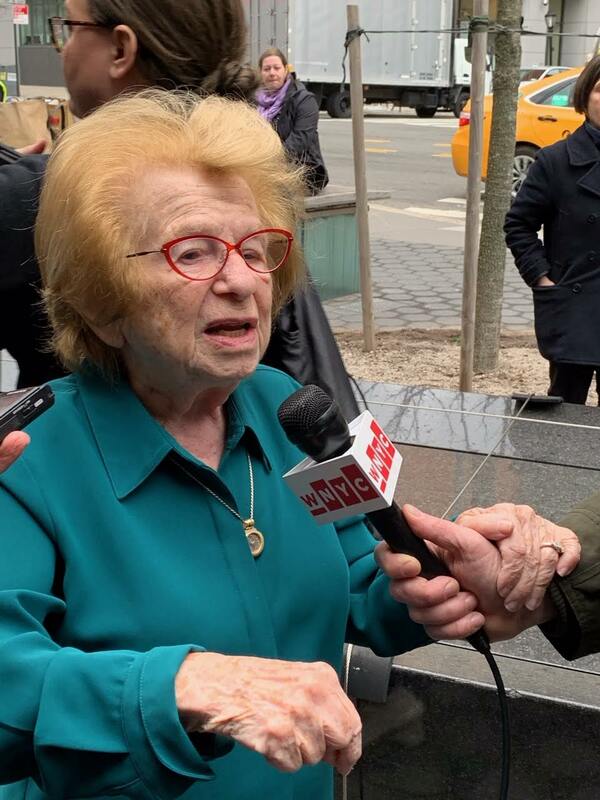 Dr. Ruth Westheimer speaking with press today. Image courtesy of Jeff Simmons, Executive Vice President, Anat Gerstein, Inc.
Auschwitz. Not long ago. Not far away. 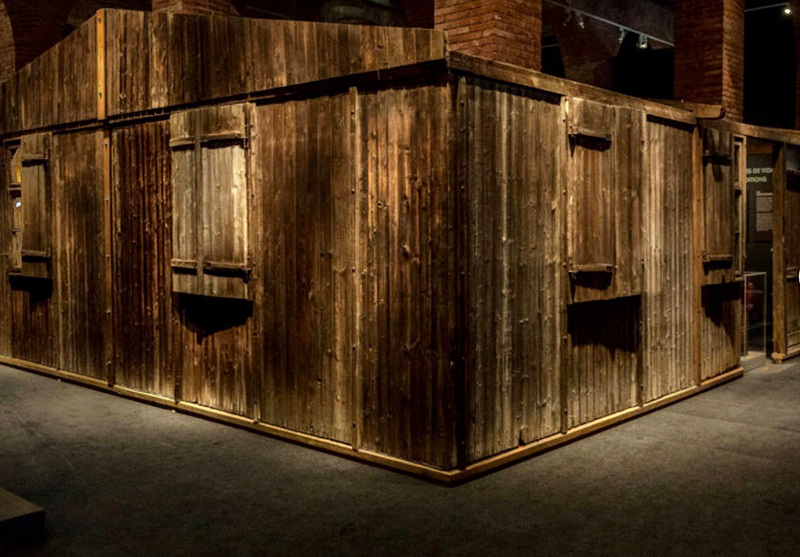 was conceived of by Musealia and the Auschwitz-Birkenau State Museum and curated by an international panel of experts, including world-renowned scholars Dr. Robert Jan van Pelt, Dr. Michael Berenbaum, and Paul Salmons, in an unprecedented collaboration with historians and curators at the Research Center at the Auschwitz-Birkenau State Museum, led by Dr. Piotr Setkiewicz. Auschwitz. Not long ago. Not far away. will be presented in the symbolic, hexagonally-shaped building at the Museum of Jewish Heritage. This 18,000 square foot exhibition will introduce artifacts and Holocaust survivor testimony through 20 thematic galleries. At the conclusion of this presentation, the Museum will debut its new permanent core exhibition. Throughout its presentation of Auschwitz. Not long ago. Not far away. the Museum will host a series of related public, educational, and scholarly programming, featuring world-renowned experts on the Holocaust. The Museum will also expand its work with students in the tri-state area and introduce complementary educational tools for in-class and onsite use. Auschwitz. Not long ago. Not far away. will be on view from May 8, 2019 through January 3, 2020 at Museum for Jewish Heritage, 36 Battery Place, Battery Park City, NYC. The Museum of Jewish Heritage ~ A Living Memorial to the Holocaust is the primary resource in the tai-state area for teaching and learning about the Holocaust and is the third largest Holocaust museum in the world. Follow on Facebook, the Exhibition Blog, meet the Historians, Purchase Exhibition Tickets.